Why should your lungs act as a filter for the air that you breathe? 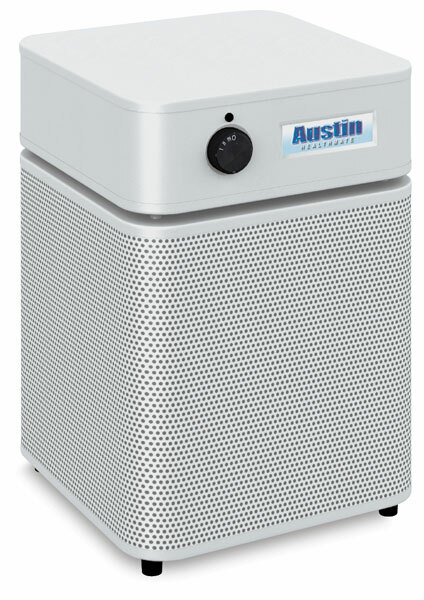 Pick up an Austin Health Mate Jr Air Cleaner, tuck it into a corner of your art studio and experience an immediate change in air quality. Don't let its compact size fool you. The Health Mate Jr makes quick work of clay dust and particulates, solvent fumes, and pesky dust mites. It cleans a room with an area of up to 700 feet when placed on its highest setting (200 CFM). The motor has a long life, and the cleaner is easy to maintain. Airflow from the steel intake housing (upper filter deck) is directed to one side of the cleaner. Composed of 6 ½ lbs of solid activated carbon and zeolite the filter traps 99.97% of particulates larger than 0.3 microns. Extra filters are sold below. The centrifugal fan has a 3-speed control. The motor is mounted on shock absorbers, rated for continuous high RPM, and long-life duty. Power consumption, at the highest setting is 80 watts. The Health Mate Jr has a baked-on, non-gloss powder coat finish over steel. The surface is lightly textured, and resists scratching and smudging. Purchase a Health Mate Jr Air Cleaner today, and make an investment in your health that will benefit all of your tomorrows.